First Corinthians 15 is the chapter, out of St. Paul’s entire corpus, which most fully expresses the Apostle’s understanding of the resurrection of the dead. The first half of the chapter discusses the importance of Christ’s resurrection and how it is inviolably linked to the resurrection not only of human persons, but of all things. 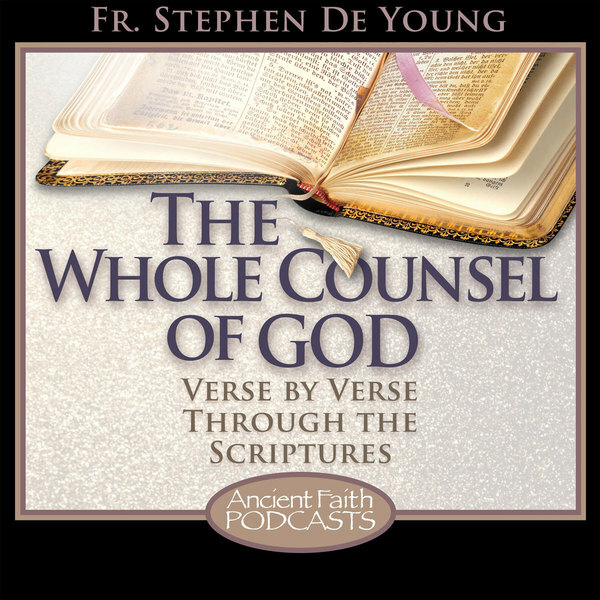 In the second half of the chapter, St. Paul describes, in so far as he can, what the resurrection of humanity and ultimately of the entire creation means. The chapter closes with St. Paul reveling in a hymn of victory over death. In the midst of this discussion, St. Paul gives a series of rhetorical examples as evidence of the centrality of the resurrection of the dead to the Christian faith. This was necessary because not all of the Jewish faithful, who formed the core of the churches which St. Paul planted, had believed in the resurrection of the dead previously. Some Jewish sects did, others did not in the 1st century, as today. The acceptance of the resurrection of Christ, however, St. Paul argues in 1 Corinthians 15:12-19, entails the belief in the resurrection of the dead. One of St. Paul’s examples in particular has been the subject of much speculation throughout Christian history. In 1 Corinthians 15:29, St. Paul refers to ‘those who are baptized for the dead’. If the dead are not raised to life, then this practice makes no sense. What exactly the practice to which St. Paul refers was, however, has not been the subject of consistent Christian teaching. Only a handful of the Fathers have extant commentary on this verse and all existing patristic commentary upon it disagrees with all other comments. Neither are these minor disagreements of nuance, but completely differing and mutually exclusive interpretations. That said, none of the existing patristic commentaries on this verse are very extensive and comment on the verse only in passing. A very close reading of the text, however, allows us to come to an idea of what this practice was. It is, in fact, a practice which still occurs today within the Orthodox Church and, ironically, was practiced even by the patristic commentators who did not make this particular connection. First Corinthians 15:29 reads, “Otherwise, what will they do, those who are baptized for the dead? If the dead are not raised at all, why then were they baptized for them?” Many modern readings and understandings of this verse are based more in the ambiguity of the English translations than on a careful analysis of the original language. Nor do many of these modern interpretations take into account the overall context of St. Paul’s discussion in this chapter, and throughout 1 Corinthians. St. Paul refers to ‘those who are baptized for the dead’, meaning that he is referring to a particular group. There are some who are baptized for the dead and others who are baptized, but not ‘for the dead’. It is important to notice that the ‘baptized’ is passive in both uses in this verse. It is not ‘those who baptize for the dead’, but ‘those who are baptized for the dead’. The action here being described is something done by those who are being baptized, not by the baptizer. So, the fact that St. Paul refers to ‘those who’ does not mean that it is some other sect outside of Christianity. This verse isn’t speaking of people who perform some type of baptism other than Christian baptism, but rather to a group of people who receive Christian baptism in a certain way. Baptism, for St. Paul, is not merely an action which conveys certain benefits upon an individual who receives it. Rather, baptism creates a series of relationships into which the recipient is brought by the action. So, for example, the Apostle can speak of those who passed through the Red Sea as having been ‘baptized into Moses’ (1 Cor 10:2). Being baptized into Moses in the cloud and the sea, the Holy Spirit and water, brought them into a relationship with Yahweh, the God of Israel and that relationship was mediated through Moses and through the covenant which was given through him. Likewise, St. Paul speaks of those who have received Christian baptism as those who have been baptized into Christ and so have put on Christ (Gal 3:27). Elsewhere in the New Testament, the baptism of repentance for the forgiveness of sins is referred to as ‘the baptism of John’ for this same reason (Matt 21:25; Mark 11:30; Luke 7:29; 20:4; Acts 18:25). In contemporary Mormon practice, living persons are baptized for deceased, unbaptized persons. This verse is often cited as witness to their practice. This is based on the assumption, among others, that ‘the dead’ to whom St. Paul here refers are deceased non-Christians who are in some way made Christians by virtue of a currently living person being baptized. There are any number of problems with this. First and foremost, it is unclear at best how a dead person receiving the mystery of baptism would benefit them, any more than a deceased person receiving any other mystery of the church. A deceased person receiving the Eucharist, or monastic tonsure, or being married makes no more sense than a deceased person receiving the Holy Spirit. St. Paul goes to great pains in 1 Corinthians 10 to argue that baptism does not necessarily entail salvation (1 Cor 10:1-6). Further, 1 Corinthians was written to the church in Corinth, at the latest, in 57 AD. This means that there were only 24 years between the writing of this epistle and the first Christian baptisms. This would mean that, hypothetically, the baptism of people on behalf of the people who died during those 24 years would have had to become a practice widespread enough in the early Christian communities that St. Paul could reference it during that window. This suggestion therefore makes neither theological nor historical sense. The key to understanding the identity of ‘the dead’ in the first half of 15:29 is obscured by the English translation. Even though it is translated in both halves of the verse as ‘the dead’, St. Paul only uses the Greek definite article in the first case. This is common for St. Paul. When he is speaking about all deceased person in the world, he does not use the definite article. He is referring to dead people in general. This is the case in the second half of the verse, ‘if the dead are not raised at all.’ When he uses the Greek definite article, which would most correctly be translated “these dead”, he is nearly always referring to deceased Christians in particular. Hence the article, to separate ‘these dead (Christians)’ from ‘the dead’ in general. 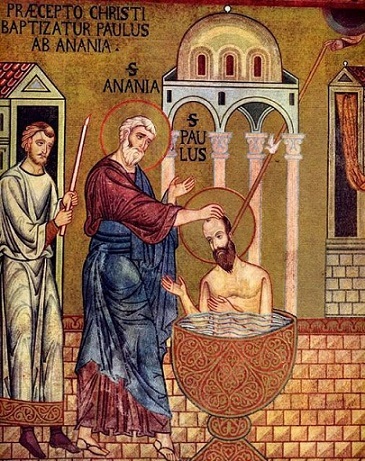 If the people to whom St. Paul refers are being baptized for dead Christians who would have themselves already have received Christian baptism during their lives, then our understanding of the baptism “for” them must change. The Greek preposition here, ‘uper’, is the source of the English prefix ‘hyper’ and is related to ‘super’ in Latin. It is the origin of English words ‘up’ and ‘over’ and the German ‘uber’. In this context, with a noun referring to persons, it can mean ‘for the benefit of’, ‘instead of’, ‘as a representative of’, or ‘in the name of’. This range is roughly paralleled in the English word ‘for’, hence the translation. If I say that I went to the store ‘for’ someone, it could mean that I went because they could not. It could also mean that I went on their behalf. Or it could mean that I went in order to be of assistance to them. If ‘the dead’ are here understood to be deceased Christians, then the most reasonably understanding is that these are people who are being baptized in the name of these deceased Christians. St. Paul has already referred us to this group of deceased saints at the beginning of chapter 15, directly before he uses this example in verse 29. The Apostle lists a great number of witnesses to the resurrection of Christ, including the apostles and at one point 500 people at once. Of these, many are still alive, but as St. Paul says, some have fallen asleep (v. 6). The use of ‘these dead’ would most naturally refer back to those previously mentioned in verse 6. St. Paul is speaking of people who, when they are being baptized, are being baptized in the name of one of these departed saints. Putting this together with St. Paul’s general understanding of baptism, we can see how someone taking the name of a departed saint at their baptism would create a relationship the person being baptized and that saint that can best be described by the Roman understanding of patronage. A Roman patron was established in a social position within Roman culture and who would then act in their position to assist someone who was beginning their public life or career. In return, the patron’s client was expecting to act in such a way that it would bring further honor to their patron and work diligently to achieve the kind of status which their patron had. In a previous post, the status that departed saints were seen to have within apostolic Christianity was discussed in relation to the Jewish understanding of God’s divine council. This understanding of the departed saints’ role in the life of the church naturally resulted in the formation of such relationships with a patron saint at the time of entry into the Christian community at baptism. St. Paul, then, in 1 Corinthians 15:29 can be seen to be referring to the practice, already beginning in the mid-50’s AD, of those who were being baptized doing so in the name of a patron saint. This practice had not yet, but would become universal in the Christian church. The Apostle’s reference to it here in this context is to demonstrate the reality of the resurrection. If the dead are not raised, then no such relationship with a patron saint could exist as that person would be dead and gone, and so the baptismal practice would make no sense whatsoever. St. Paul’s reasoning here is roughly parallel to Christ’s argument against the Pharisees in Mark 12:26-27 and Luke 20:37-38. God is the God of Abraham, Isaac, and Jacob and he is not the God of the dead, but of the living. The apostles and witnesses of Christ’s resurrection who had already fallen asleep in the Lord at the time of the writing of 1 Corinthians had joined Abraham, Isaac, and Jacob in the resurrection. They could intercede for those in the church in this world and especially for those who lived a life of faith in their name, bringing honor to their memory. These entries must be published in book form. Thanks Fr. Stephen. This is really interesting, Father. Not only does it make sense, but you present a strong case with your line of thought. I can’t help but wonder two things…is this your own conclusion to the meaning of 1Cor 15:29? Is anyone else teaching this? (I hope so!) And, how did the Father’s miss this?! I too hope someday you put ‘The Whole Counsel’ in book form. I don’t know of anyone who has put it together exactly the way I do here. There are however a number of scholars with a similar interpretation, including a few Protestant scholars who have views approximating this despite not having the whole concept of saints as heavenly patrons to join to it. Cloppenburg, Joel White, and James Patrick would be three examples of that. Vis a vis the Fathers its hard to even tell if they missed it, as there is very little patristic commentary on this verse. A lot of what gets listed as commentary on it isn’t really. For example, Didymus the Blind mentions at one point that the Marcionites practiced baptism for the dead. And since the phrase is similar, it gets listed as commentary on this verse. But it isn’t really, and Didymus does not explain what exactly they did. And St. John Chrysostom when he gets to this point in 1 Corinthians gives a very good excursus about how our bodies are dead due to sin but receive new life in the resurrection. It is true and worth reading, but doesn’t make much sense in terms of being what St. Paul originally intended to say. And no other Father applies those ideas to this verse, even when discussing those ideas. We always have to remember that we have a tiny fraction of what the Fathers wrote available to us today. And a lot of what we have is fragmentary, not in the original language, or both. New works are still being discovered and translated. So its entirely possible that the Fathers had a very clear understanding of this and it just hasn’t survived down to our own day, at least in their writings. If that becomes clear at some point in the future, and its different than mine, I will happily admit that I was wrong and be corrected. Thank you for your response, Father. Interestingly, last night after reading your post I did a search for commentaries on 1 Cor 15:29. As you said, they are many and varied. Your mention of James Patrick rang a bell. I came across one of his articles I thought was similar to your teaching. It’s title: Living Rewards for Dead Apostles: ‘Baptised for the Dead’ in 1 Corinthians 15.29. It was the only one I could find that was somewhat close to yours. Thanks also for the reminder that we have relatively small number of the Fathers writings available to us. Naturally, you would willingly stand corrected if you found the Fathers had something different to say. But I wouldn’t be surprised, and would be delighted, if something did come up that both would have the very same line of thought! Might it have been such an obvious and well known practice, that no necessity to comment existed. As a Mormon who recently converted to Orthodoxy I find this very enlightening! This is the first time I’ve seen any Christian address this verse and actually give a reasoned explanation instead of just saying, “ya idk what Paul’s talking about but it’s def not that Mormon baptizing dead ppl stuff”. Adam, I’m a Mormon currently exploring the Orthodox faith. I’d be interested in connecting and hearing your experiences. Any chance of that?